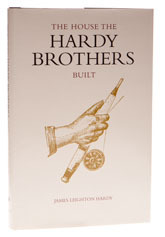 This classic book was first printed as a limited edition in 1998, so it has not had the exposure it deserves – which is a shame, because not only is the history of Hardy Brothers an interesting one, but Jim Hardy writes extremely well. There is much to tell: for example, it will come as a surprise to many readers to hear that when Hardy Brothers was founded in 1873, it was as a gunsmiths, whitesmiths and cutlers - it was in the following year that they made a move into the fishing tackle trade and they didn’t pause to look back for another century and a quarter. Jim was involved in the management of the company for 44 years, before finally retiring in 1992; during his life he won numerous casting championships, so he is ideally placed to write the history of this icon of British angling. This is the definitive history of Hardy Brothers and one of the most readable histories of any tackle company around.